Computer Security Products, Inc. offers a range of physical safeguard products to help you with HIPAA, CIPA, or Gramm-Leach-Bliley privacy and security compliance. Available in 1-, 2-, 3-, 4- and 5-drawer versions. Constructed of heavy 16-gauge formed steel. Built-in spring loaded hinge. File bars swing clear of the file doors. 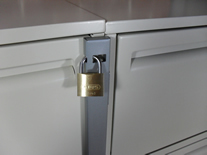 Hospitals are required to lock up their blood samples and medication. Use this fridge lock to secure refrigerators or other openable equipment where entry control is necessary. Available in black and white. These privacy filters help companies comply with federal privacy laws requiring protection of personal and confidential customer information. Available in many sizes for computer monitors and laptops. PrivateVue™ - a privacy filter permanently installed on a computer monitor preventing filter removal and keeping you compliant with privacy laws. Available in many sizes for Dell, HP, and ViewSonic monitors.